Established in 1997, Netflix Inc. introduced a subscription-based DVD-by-mail service in 1999, and went public in 2005 at a share price of $15. At this stage, Netflix--whose basic plan now sits at $7.99--has upwards of 69 million subscribers around the world, a figure that is likely to dramatically increase following recent entry into 130 additional territories in January 2016. (Johnson) Crucially, Netflix is no longer just an aggregator of content from various networks and studios, but rather its own provider of quality film and television content. To date, the impact of Netflix is undeniable and far-reaching. Precisely what this new technology has done, and is continuing to do, to the film and television industries should not go unacknowledged. 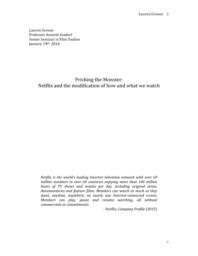 Namely, one can pose the question, how does Netflix modify not only our cinema and television-watching habits, but also the content that is produced and consumed? This senior essay is the recipient of the 2016 Andrew Sarris Memorial Award for Film Criticism, awarded by the Film Program of the School of the Arts, Columbia University.